Greens are overflowing the farmer’s markets and my garden. 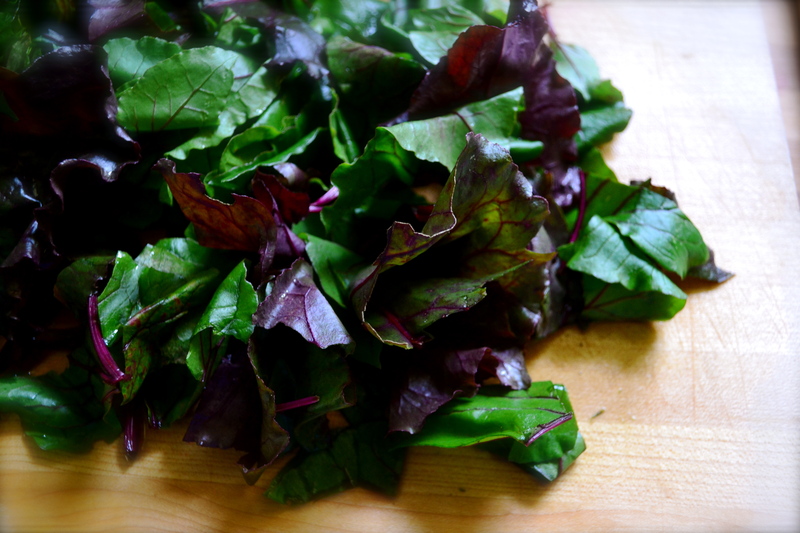 Now is the time to load up on fresh leafy greens like chard, kale, mustard greens, and lettuce. It was a shock to the system to arrive home from vacationing in cold South Dakota (highs in the 40s) and arrive in KC with heat indices topping at 100 degrees!!!! Today has been full of harvesting my spring plants and planting summer crops of basil, cilantro, beets, green beans, tomatoes, strawberries, and more chard. I can’t get enough! Plus, adding greens makes me feel not so guilty when I partake in one (or three) brews for Memorial Day celebrations and maybe an extra hunk of dark chocolate. Shhhh! So back to those lovely greeeeeens. This is why today’s Food Matter’s recipe, Beens N’ Greens Burritos (chosen by Good Things Grow) is perfect for this time of year. I slightly adapted the recipe as a breakfast dish, adding a poached egg and serving it on corn tortillas instead of flour. I prefer corn tortillas to flour (even whole wheat flour tortillas), because they are less processed and typically have less than 5 ingredients. Corn tortillas also topically have more protein, fiber, and less carbs than their flour brethren. 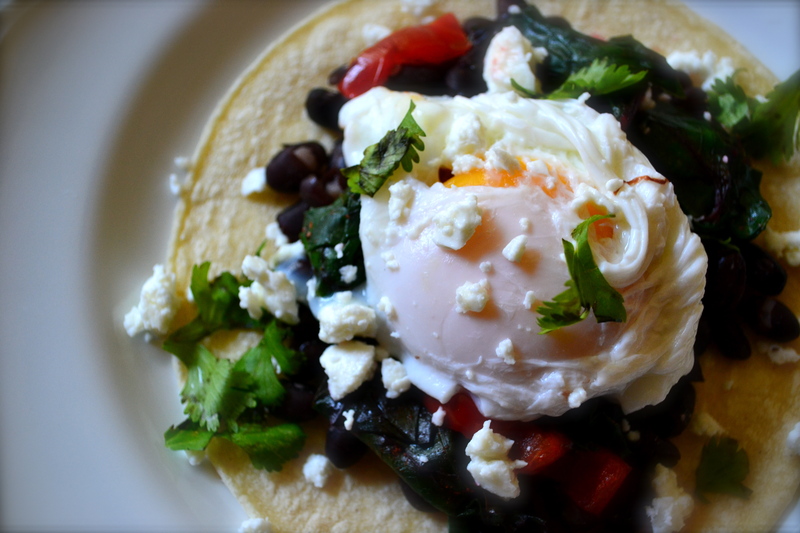 This is basically the same as my Huevos Racheros recipe, but with the addition of swiss chard. Yum. Great start to the day! Heat olive oil over medium-high heat in a skillet. Add onion and sauté for 5 minutes or until translucent. Add chard and sauté for an additional 5 to 10 minutes, or until chard wilts. Add black beans and heat through. Remove from heat and set aside. Cook eggs to your liking. I prefer poached…mmmm. Heat tortillas by either throwing them in the microwave for 15 to 30 seconds or over the stove in a pan with with a tad bit of olive oil. Place one tortilla on each plate. Divide chard/black bean mixture among each plate. 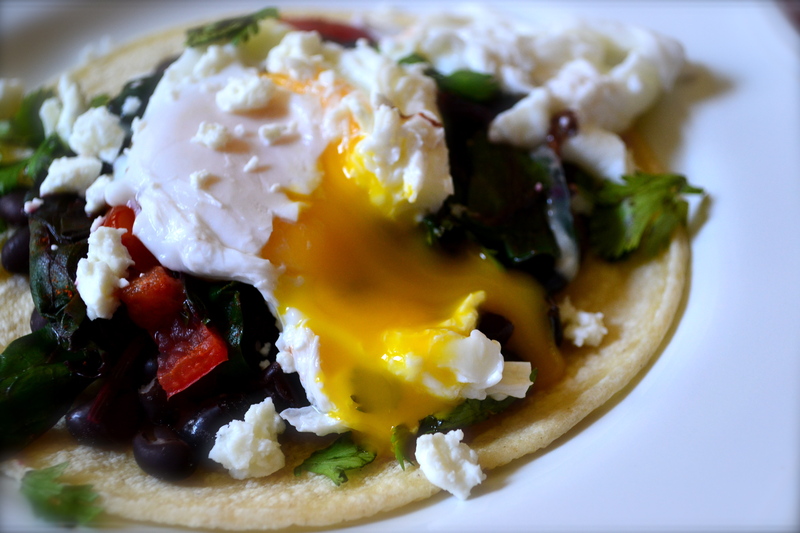 Top with cooked egg, feta, and cilantro. Dive in! Oh Alissa…you are killing me with these gorgeous photos. Want to come out to California and teach me? The burrito sounds great. Oh! I love the breakfast twist to this and that gooey egg on top! That is a beautifully cooked egg! Thanks! I’m trying to get better at poaching them. That egg looks gorgeous! I definitely need to take a bit of out that! Yay for summer, I love having so many more vegetables and fruits to choose from! I just want to tell you how much I loved this! I used kale (I didn’t have any chard) and no cheese or cilantro. I made it with an egg, without egg, on tortillas, on toast, without any bread, etc… savory and comforting and yummy, especially after a 20 mile run. I’ve made it 3 times in the last week!